The Red Sox win their third straight behind Daisuke Matsuzaka's stunning turnaround. 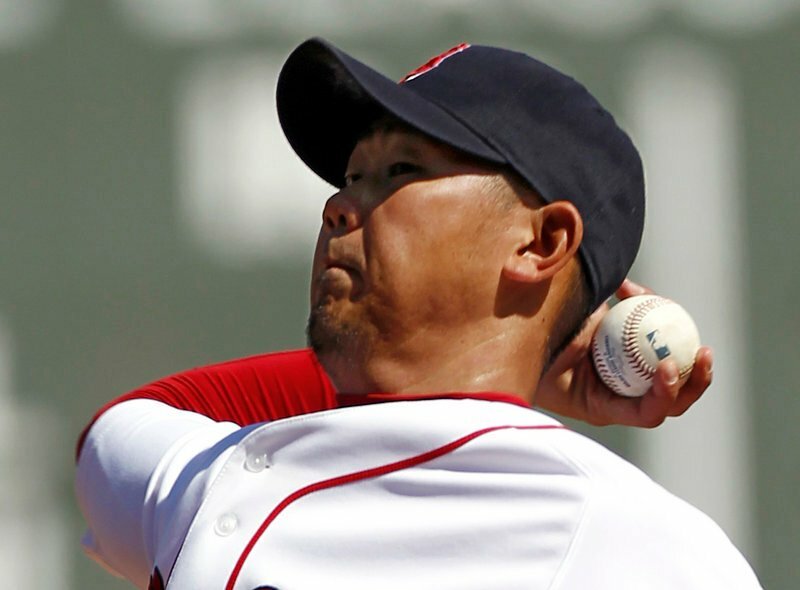 BOSTON — Daisuke Matsuzaka wanted to impress his old pitching coach. Daisuke Matsuzaka gave up just one hit over seven innings Monday after one of the worst outings of his career. Monday’s showing cut his season ERA from 12.86 to 6.43. Matsuzaka pitched one-hit ball for seven innings after one of the worst outings of his career and Boston got an early start on its third straight win, beating the Toronto Blue Jays and new manager John Farrell 9-1 on Monday in the traditional Patriots Day game. “Farrell is on the other side so I wanted to show solid pitching in front of him,” Matsuzaka said through a translator. For the past four years Farrell tried, often unsuccessfully, to get Matsuzaka to attack hitters and cut down his pitch count. On Monday, the right-hander threw just 89 pitches against the free-swinging Blue Jays, whose impatience at the plate worked in his favor. More important, Matsuzaka impressed his own manager, Terry Francona, after entering the game with a 12.86 ERA in two starts. Matsuzaka permitted only two base runners, matching the fewest he’s allowed in his 101 major league starts. The game began at 11:07 a.m. at Fenway Park. Matsuzaka (1-2) got plenty of support as Jed Lowrie’s four hits led a 13-hit, three-homer attack. Matsuzaka gave up a clean single to center to Jose Bautista with two outs in the first. He walked Travis Snider with two outs in the second, then set down his final 16 batters to improve to 7-1 against the Blue Jays. He struck out three and walked one. In his previous start against Tampa Bay, he allowed seven runs in two innings. Toronto finished with two hits. Yunel Escobar homered off Tim Wakefield in the ninth. Lowrie hit his second homer, a two-run shot in the fifth off Ricky Romero (1-2) that made it 5-0, and finished with four RBI. He now has 15 hits in his last 24 at-bats. At one point, Lowrie’s .533 batting average was posted on the scoreboard. 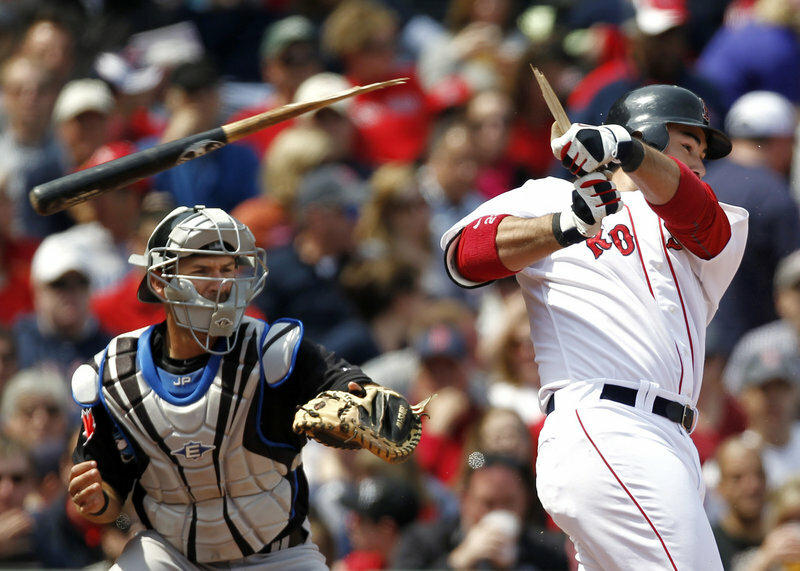 Kevin Youkilis and Jacoby Ellsbury also homered. The festive day marked another special occasion – a hit by Carl Crawford. Boston’s left fielder, signed to a seven-year, $142 million contract in the offseason, broke an 0-for-15 slump with an RBI double that made it 8-0 in the sixth. Crawford, booed after his previous at-bat, received a standing ovation as he raised his batting average to .136 (8 for 59). Romero allowed five runs in 4 1/3 innings with four strikeouts, eight hits and fine walks. The Red Sox have appeared to straighten out their season since losing their first six games and opening at 2-10, matching their worst 12-game record ever. Then they got three straight outstanding starting performances from Josh Beckett in a 4-1 win on Saturday and Jon Lester in an 8-1 win on Sunday. Matsuzaka’s brilliance was surprising after his bad outing on April 11 in a 16-5 loss to Tampa Bay. His ERA dropped Monday exactly in half, to 6.43.